Though Little Italy has always been one of Montreal’s more popular neighbourhoods, a surge in interest in the last couple of years has Montrealers flocking back in droves. Six months ago, Quindici joined the area’s restaurant ranks as one of Little Italy’s newest and buzziest eateries. 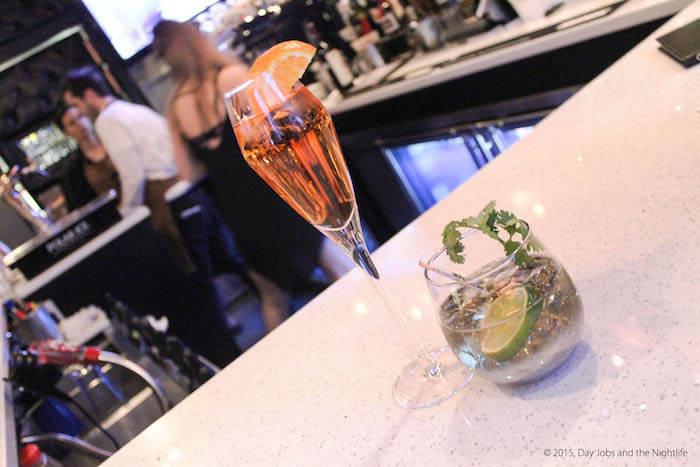 Last week DJNL was invited to take a seat at Quindici to try the food and see what all the buzz is about. Ludovic Beauregard is one of Quindici’s managing partners and he brings some impressive experience to his first restaurant. Ludovic hails from a busy start with the Tomnacos Group (including Newtown, Decca 77 and Atelier d’Argentine) before moving on to work for the Morentzos Group (Pois Penché, Queue de Cheval). When you’re learning the ropes in the restaurant business with groups like this, you’re setting yourself up to have some of the best experience in the business. When Ludovic was looking to open his own place, Montreal wasn’t his first choice for a location but then those magic pieces started falling into place, an excellent space opened up and soon enough Quindici was born. The restaurant was full the night we went. The sounds of laughter and chatter blended perfectly with the orchestra of clinking plates and cutlery. It was early on a Saturday night, the sky was clear and people were out to enjoy their evening. We were set up at the bar, an excellent vantage point when you want to observe the crowd and get a feel for the atmosphere. The décor of the restaurant fits in very well with the neighbourhood. 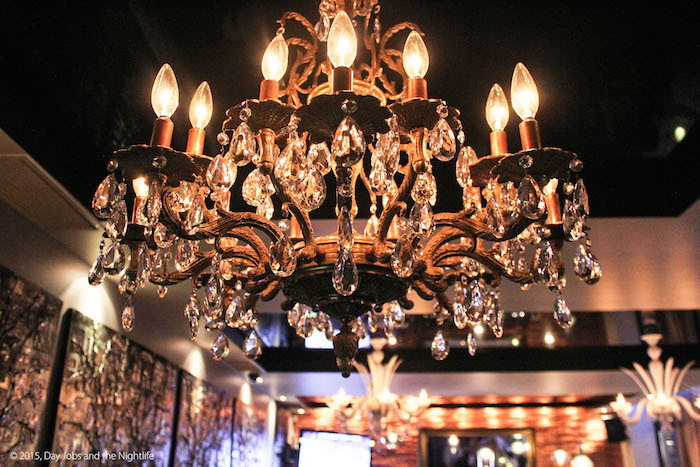 It has sleek elements including crisp white linens, black lacquered ceilings, a bronze coloured wall of stone behind the bar and dangling chandeliers. 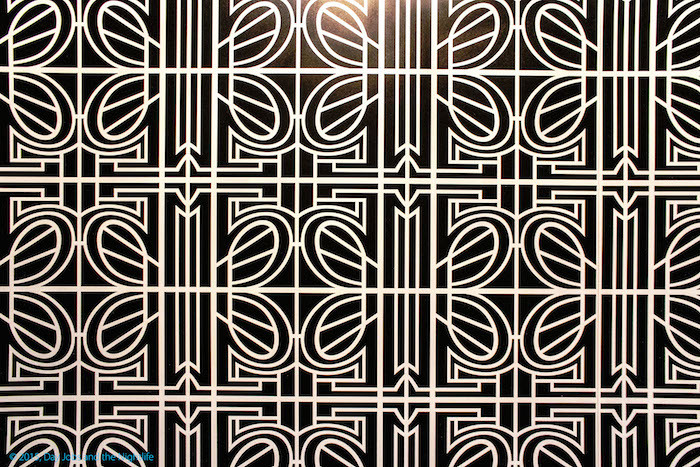 The number 15 (quindici is 15 in Italian) is repeated on an exquisite custom wall covering. The art deco design that sneaks in the number 15 isn’t just clever; it’s artistic and beautiful, giving the restaurant a “Great Gatsby” vibe. 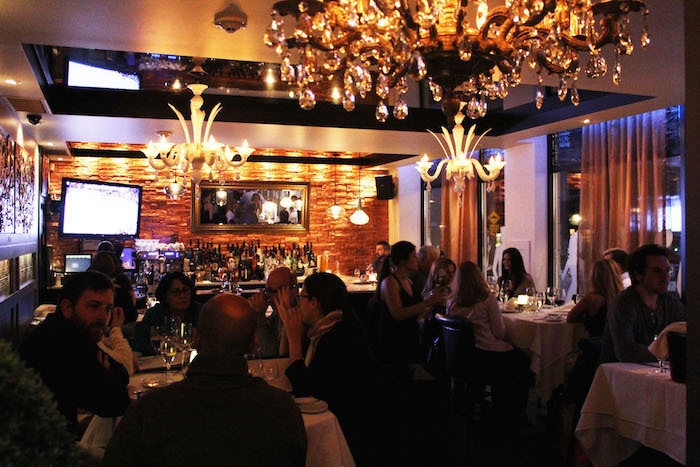 Quindici is split into two distinct dining rooms, one of which can be reserved for larger functions. The overall concept works very well with the only element left to question being the frosted cutouts of people that cover the windows. The food we tried was quite good. We started with a couple of cocktails to kick things off before ordering our meals. The Quindici menu is packed with fresh fish choices, savoury meats, pastas, antipasti, soups and salads. To start we chose the fried calamari and the grilled vegetables. 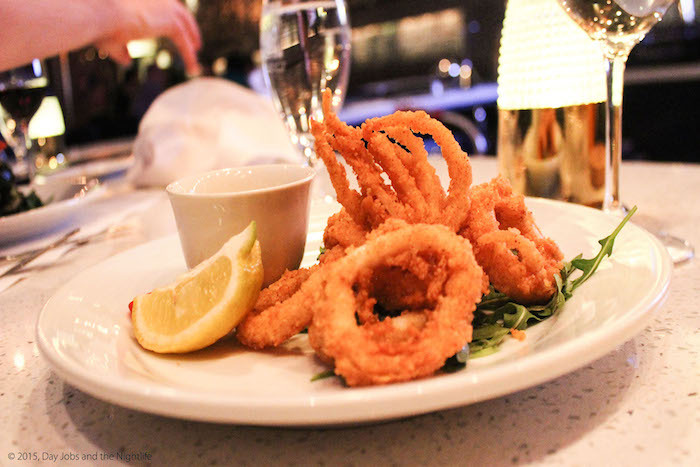 The calamari was fried to perfection, lightly breaded with cayenne and paprika and served with a homemade aioli. The grilled vegetables were wonderfully seasoned, piping hot and filled with flavor. Including eggplant, peppers, asparagus and mushrooms, the seasoning brought out the diverse flavours of each of the vegetables. 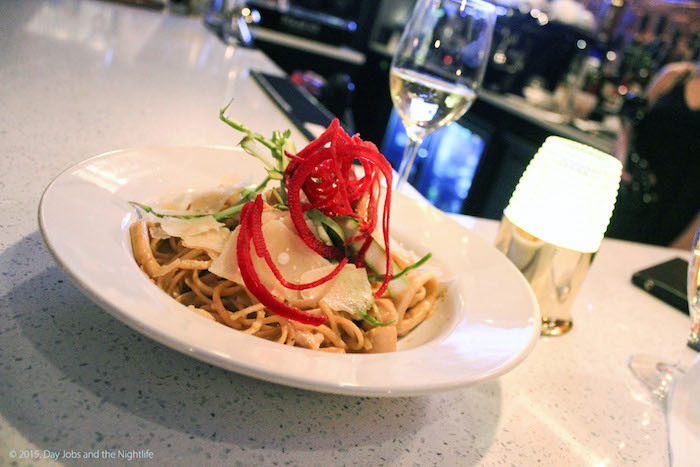 For our main courses, we chose their seafood linguine and the special Quindici pizza. The linguine was loaded with calamari, scallops, octopus, shrimp, lobster and crab. There seemed to be more seafood than pasta, which suited us just fine. The pizza had a thick chewy crust and was covered in homemade tomato pesto, kale, asparagus, green olives, sausage meat, chorizo, pancetta and cheese. An intriguing cinnamon flavor came from the blending of these elements. For dessert (yes, there was still room) we devoured their homemade vanilla crème brulée and a caramel coated cheesecake with brownies. To say descendant would be an understatement. 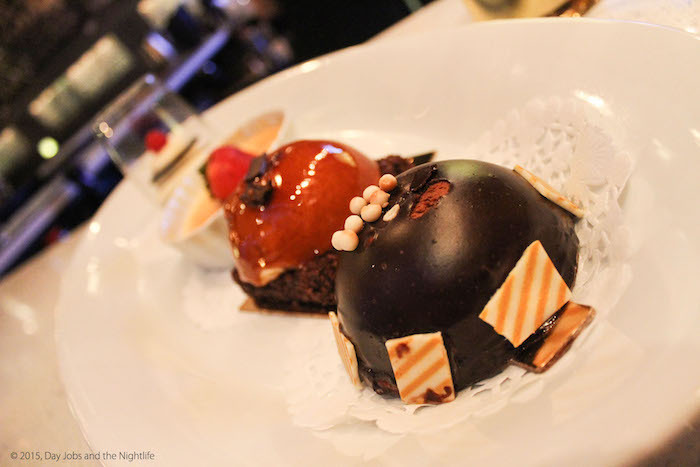 The desserts will change every week so there will always be something new to try. Our service was friendly, engaging and courteous. More than that, our vantage point allowed us to see the team effort of the waiters and waitresses as they warmly served the other tables around the restaurant. 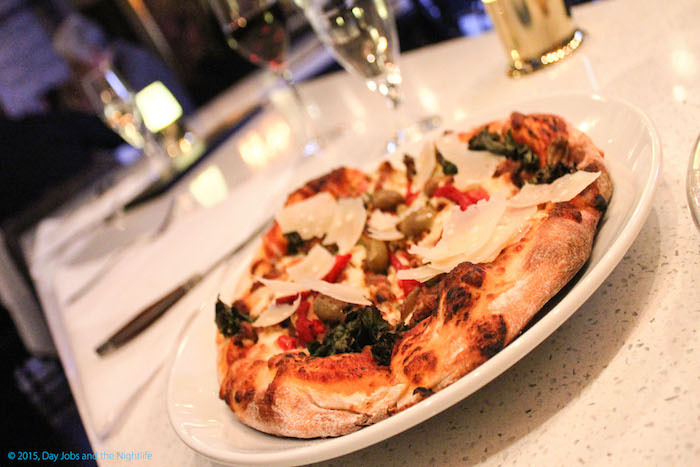 Quindici’s success is a sign of prosperous times in Little Italy. The area is about to undergo a few renovations that will solidify the community feel of this very distinct neighbourhood. As the temperature warms up, Quindici15 will soon open its street level terrace, which will add 40 seats just outside the restaurant. It will be a wonderful way to enjoy people watching and a delicious meal. For more, visit their website here and don’t forget to follow us on Facebook to see more exclusive shots from our night at the restaurant.